A Fighting Chance :: Movie Information :: RabbitTV GO! 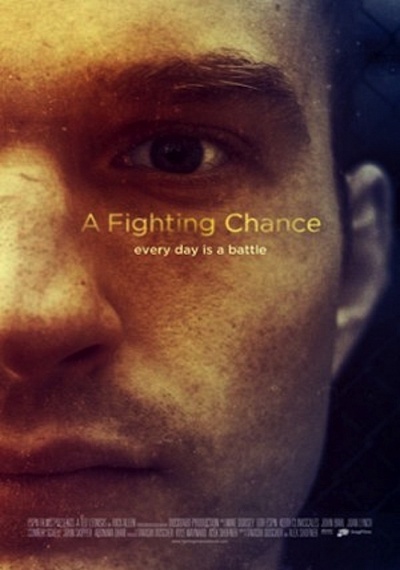 A Fighting Chance is the vivid, character-driven story of Kyle Maynard, a young man born without arms or legs. At 23 years-old, Kyle has already become a nationally ranked wrestler, ESPY award-winner, motivational speaker and bestselling author. However, when Kyle seeks an official Mixed Martial Arts match against an able-bodied fighter- a highly controversial and dangerous goal - Kyle has to face even greater challenges in a world that fails to see him as anything but "disabled." Whether fighting in the MMA cage or extending his "No Excuses" philosophy to recovering military veterans, Kyle Maynard shows what life can be like when every day is a battle.